The EC department in DGH receives applications from various operators for duty free import of goods. 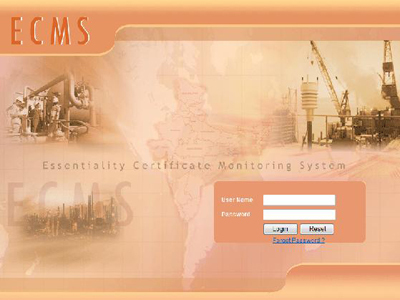 This department complete all formalities & issue certificates within stipulated time frame. Besides, the department also issues NOC’s for transfer of goods within the country. 214- Goods required for PEL/ML blocks granted by Government of India or state Government to ONGC/OIL on notification basis. 215- Parts and raw materials required for manufacture of goods for offshore operation. 217- Goods required for blocks under NELP. 218- Goods required in connection with (CBM operations). Issue of EC (Essentiality Certificate). Issue of NOC (No Objection Certificate) for transfer of goods. Extensions and amendments of ECs . Audit on utilization of Ecs. Environmental Clearance : The Ministry of Environment, Forest & Climate Change (MoEF&CC) has made the Environmental Clearance (EC) mandatory for various projects , including E&P sector, under the Environmental Impact Assessment notification of 14th September, 2006. For facilitating preparation of Environmental Impact Assessment reports, technical guidance manual for E&P sector has been finalized by MoEF&CC and displayed on the Website. Ministry has also developed standard Terms of Reference (ToRs) to conduct of EIA study for offshore and onshore Oil and Gas exploration, development and production activities. These standard ToRs will enable the operator to commence preparation of EIA after online submission and registration of application.Exploration and Production of oil and gas is a permissible activity under the Coastal Regulation Zone (CRZ) Notification 2011, but permission would be required from MoEF&CC based on recommendations of the State Government(s).Details of EIA notification 2006, it’s amendments from time to time, CRZ notification, 2011, various circulars related to environmental clearances, online application for EC , list of accredited consultants for preparation of EIA reports, tracking project clearance status , meeting dates and minutes of the Environmental Appraisal Committee (EAC) can be viewed on website (www.envfor.nic.in). Forest Clearance : If the E&P operations involve diversion of forest land, then Forest Clearance (FC) under the Forest (Conservation) Act, 1980, is required. Forest (Conservation) Rules have also been revised in April, 2014 to give special considerations for exploration surveys including for Oil and Gas and Annexure C has been added.Further a notification G. S. R. 713 ( E) dated 10th October, 2014 has been issued namely, “The Forest (Conservation) Second Amendment Rules” for consideration of forest diversion cases in various slabs such as up to 5 ha., between 5 and 40 ha., above 100 ha. etc along with timelines and level of consideration. Regional Empowered Committee have also been constituted to deal with forest diversion cases at regional level. As in case of EC, details can be viewed on website (www.envfor.nic.in). Article 14 of the Production Sharing Contract (PSC) deals with ‘Protection of Environment’ and stipulates that the Contractor shall ensure protection of environment and conservation of natural resources by adopting modern oilfield practices/standards, advanced technologies, practices of operations to prevent environmental damage. As per article 14.5.1 of PSC, the Environmental Impact Assessment (EIA) studies shall be carried out in two parts, namely, a preliminary part which should be carried out before commencement of any field work relating to seismic or other survey, and second part relating to drilling in the exploration period as per provisions of EIA notification 2006. The part of study relating to drilling operations shall be approved by Govt. Of India before commencement of such work. As per article 14.5.2 of PSC, the second part of study is also to be completed before commencement of development operations and approval of Govt of India is to be obtained before commencement of development operations. The Article further states that in the event of emergency like accident, oil spill, fire etc the Contractor shall implement relevant contingency plan and perform such site restoration, as may be necessary. Further, if the contract area is partially located in areas which form part of certain National Park, Sanctuary, mangroves, wetlands of national importance, biosphere reserve and other eco-sensitive zone, passage through such areas shall generally be not permitted. However, if there is no passage, other than through these areas to reach a particular point beyond these areas, permission of appropriate authorities shall be obtained. Details of PSC for various bidding rounds are displayed on the website of DGH. The policy apart from laying guidelines for extension of Exploration phases under NELP and Pre-NELP production sharing contracts also has provision of demonstrable delay on account of getting govt approvals/permits/clearances being counted as excusable delay. The policy apart from laying guidelines for extension of Exploration phase I & II in CBM contracts also has provision of demonstrable delay on account of getting Govt approvals/permits/clearances which are not attributable to contractor being counted as excusable delays and condoning of such delays. Section 3 of the policy covers the reduction in Minimum Work Program (MWP) in cases of blocks overlapping with Special Economic Zone (SEZ), reserve forest, naval exercise areas, National Parks and firing ranges etc. The details covered in this section also include choice to the operator to exit the block due to lack of statutory /other clearances beyond two years, reduction in PEL fees etc. Details can be seen on the website of Ministry on Petroleum and Natural Gas/DGH. The National Oil Spill Disaster Contingency Plan (NOS-DCP) is the national plan for dealing with the Oil Spill response in maritime zones of India. This plan was originally promulgated in 1996 and has been revised in 2015. The NOS-DCP delineates responsibilities and preparedness by various resource and oil handling agencies beside government agencies. It also covers responsibilities of state level agencies, concerned coastal state pollution control boards, involvement of NGOs, the public information mechanism etc. The Indian Coast Guard (ICG) is the central coordinating authority for enforcing the provisions of the NOSDCP in the maritime zones of India. All the offshore E&P operators are required to establish the necessary oil spill contingency plan, effective maintenance of oil spill preparedness and on board Tier-1 level oil spill response facility. The details can be viewed on website www.indiancoastguard.nic.in. Legal opinion on the issues referred to legal section in connection with various activities being undertaken by DGH. Vetting of Contracts and Memorandum of Understanding (MOU). Legal comments on behalf of DGH to MOP&NG in connection with interpretation of Petroleum Laws & relevant rules framed there under and on other issues which are being referred time to time by MOP&NG to DGH. Drafting of correspondence with contractors in connection with various issues being raised by contractors under PSC’s. Legal vetting of Bank Guarantees, Amendments to PSC’s etc. Handling of Arbitration matters before Arbitral Tribunal. Recommendations for appointment of outside counsels. Preparation of parawise comments in close liaison with the concerned section on facts given by claimant or the petitioner as the case may be. Legal scrutiny of parawise comments. Liaison with advocates for drafting of reply on behalf of GOI/DGH. Vetting of written statements / replies to be filed on behalf of GOI / DGH in Arbitration / Court matters. Instructions to Advocates for suitable steps in Arbitration and Court matters. Attending the hearings before Arbitral Tribunal or Court along with outside counsels and representative from the concerned departments. Payment of fees to Arbitrators and outside counsels. Liaison with Ministry to appraise the development in the concerned matter and to obtain necessary approvals from Ministry wherever required. Legal scrutiny of Arbitration Award or Court judgment for advising further action i.e. whether the Govt. should accept the particular Arbitration Award or judgment or to file appeal challenging the said award or Court judgment before the court of competent jurisdiction.